If you've been on twitter at all today you might have noticed a certain #GRLPOWR tag being thrown around a lot and therefore may be wondering what? who? huh?? Well I'm thrilled and over-the-moon-excited to add my voice to the train of explanations currently happening! Since the beginning of this week there's been an almost non-stop active group chat between myself and several other lovely ladies; I don't think ever I've jumped headfirst into a conversation and been caught in such welcoming arms before.. there has been nothing but kindness, helping each other out and love. 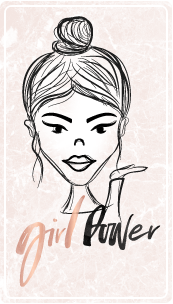 Together we decided that we had so much grlpowr between us that we might as well make use of it and so the #GRLPOWR bloggers community & chat was born! So; what do you need to know about it? There are going to be two twitter chats; one on Tuesday's at 9pm and one Thursday's at 8pm. The first one is next week: 30th August and will be hosted by the lovely Lauren! Not only will we be hosting two chats a week but every single sunday on our twitter we will be having 'Supportive Sundays' where anybody can tweet us any issues or problems and all the admins will be taking shifts to reply and help you out; from friends to relationships we'll be there. You can follow @grlpowrchat on instagram and twitter! Spread the love, the word and the grlpower by adding #GRLPOWR to your tweets, we'll see it and retweet it. We've created our own blog as well; we'll be posting on there ourselves but we'd love to host lots of guest blog posts on there; check it out here and get in touch via our twitter if you're interested! They're all amazing girls so I definitely vote for going and following them all! Keep an eye out on the @GRLPOWRCHAT twitter for updates on chats and anything else we plan..